We need someone to help us convert fraction to percentage for the annual Hot Air Balloon Festival. The Zapzapmath Hot Air Balloon Festival is an all-day event that has mathlings packing picnic baskets and coming in from all around the ecosystem to celebrate this much loved family occasion together in perfect harmony, where fraction to percentage conversion is used to fuel up hot air balloons! This year, you are participating as a part of the hot air balloon maintenance team. Your task as one of the officers in charge is to ensure that each hot air balloon gets a substantial amount of fuel to lift them off the ledge and get them flying high. Estimating fuel can be a heavy duty, but you know you have the right tools of the trade to get these balloons soaring in no time! Since each hot air balloon has different weight and fuel requirements, you need to check them one by one. To fill each balloon with the right amount of fuel, convert the provided fraction to percentage. You can do this by finding the equivalent fraction in denominators of 100, or by multiplying the fraction by 100. When you have completed the conversion, key in the percentage of fuel required by tracking and rotating the dial until you arrive at the amount you want. Tap 'Submit' to answer. With the right conversion, we will see a successful lift-off from one ledge to another, whereas the wrong conversion will either mean there's not enough fuel for a successful takeoff, or the hot air balloon will soar way up and out of the atmosphere! In this unit of inquiry, you master the conversion of fraction to percentage. The ability to convert numbers, fractions, and decimals into percentages is beneficial to your mathematical development. Hot Heads is a game that practices your understanding of percent as rate per 100. The gameplay is both light and engaging, creating a casual environment for a lesson. By forming a solution between the conversions of fractions to rates of a 100 percent, you are providing yourself with the ability to describe quantity with a percentage. This results in a better grasp on both measurement methods as a whole. 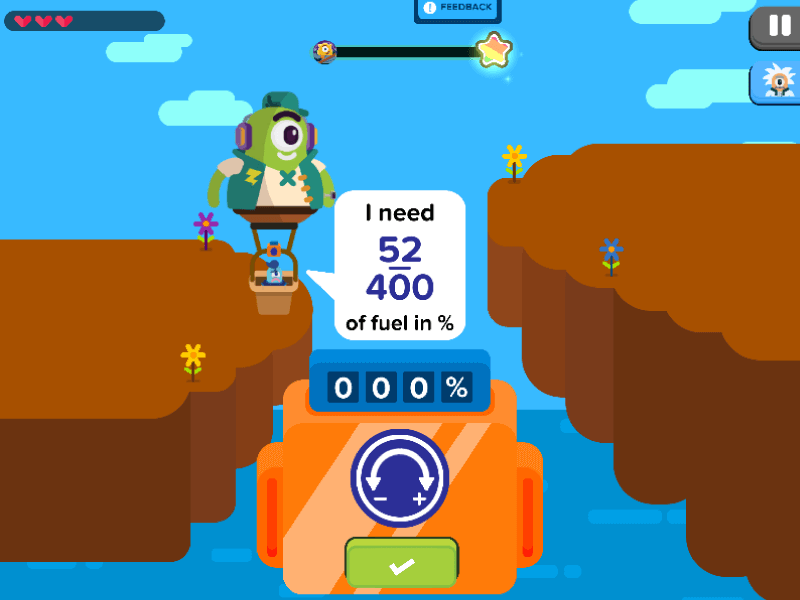 Fill Hot Heads with fuel conversions!